Bouchra Khalili. The Mapping Journey Project. 2008-2011. Eight-channel video (color, sound). Installation view, Bouchra Khalili: The Mapping Journey Project, The Museum of Modern Art, New York, April 9 – August 28, 2016. The Museum of Modern Art, New York. Fund for the Twenty First Century, 2014. © 2016 Bouchra Khalili. Digital image © 2016 The Museum of Modern Art. Photo: Jonathan Muzikar. 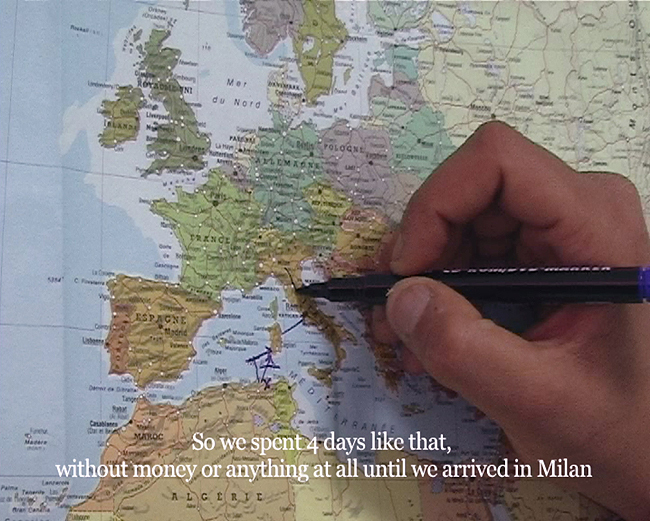 This isn’t the first time that Bouchra Khalili’s ‘The Mapping Journey Project’ (2008-11) has been exhibited – it was shown in part two years ago at New York’s New Museum – however, the current context of the accruing refugee crisis and the mainstreaming of anti-migrant discourse has clearly magnified its social and artistic relevance. For IAM, Valerie Behiery reviews Khalili’s current installation, exhibited at the Museum of Modern Art (MoMA), and its topical significance. The work on display in MoMA’s large Marron Atrium consists of eight videos recounting the trajectories of the same number of undocumented migrants fleeing political or economic hardship. Their sometimes-harrowing stories and the intriguing way in which Khalili chose to tell them make the exhibit well worth the visit and confirm the importance of Khalili’s work more generally. The minimalist device the artist uses for each of the migrants’ journeys is the same. The camera stays framed on the static image of a printed colour map; the only movement is that of the migrant’s hand tracing their journey with a felt pen marker while they narrate their story for the viewer. Khalili’s decision to not show the participants’ faces accomplishes several things. By circumventing the media’s generic images of refugees and all the associations therewith, it individualises the migrants and gives them a voice. It also obliges spectators to listen attentively and fill in the gaps by imagining the journeys themselves. Employing the spaces off-screen and the audible to represent marginalised individuals evokes their usual misrepresentation and social invisibility while also recasting representation to encompass both the seen and the unseen. The visual and conceptual concordance at work here between the margins of representation and those living on the margins of society goes a long way in explaining the power of this timely work. ‘The Mapping Journey Project’ is compelling as an installation: the map, hand and felt pen motifs unify the eight videos projected onto large screens scaled to the distance of the journeys undertaken. A bench and three pairs of headsets placed beneath each screen allow spectators to hear the individual stories of each of the eight subjects that the artist met in cities known as migrant hubs like Marseilles, Bari, Istanbul or Ramallah. Some of the journeys are unpredictably abbreviated – like in Mapping Journey#4, where a woman from Mogadishu gets caught and deported to Italy as she was heading elsewhere – while some are very circuitous. In Mapping Journey #6, a young man wanting to reach Italy describes his journey; leaving his native Afghanistan, he makes his way through Pakistan to Iran before walking to Istanbul. He then travels through Bulgaria, Hungary, Austria, Germany, Belgium, England and France, finally making his way to Rome! The visual and conceptual concordance at work here between the margins of representation and those living on the margins of society goes a long way in explaining the power of this timely work. Seeing the world through the eyes of the migrants – whom Khalili prefers to call ‘resistants,’– rather than through the lens of the state apparatii offers an alternative perspective to either political talk or media discourse on the displaced. Because the narrators tell their stories in a way that is as matter-of-fact and pared down as the images, we also hear the individuals’ stories unfettered by pathos or sentimentality. ‘The Mapping Journey Project’ is related to Khalili’s other art projects in that theory, praxis and aesthetics work together synergistically. The stories of the participants are heard; they are not overshadowed by the project’s larger political intent to probe the geopolitics of maps and the related issues of national boundaries and citizenship. The eight narratives reveal what or, more aptly, whomthese occlude – explaining the artist’s insistence that her work is not about migration or identity but about the lives and experiences of politically ‘minoritised’ individuals. The videos present us with an alternative geography, fashioned by a network of individuals who make their way across borders despite the violence that can await those not in possession of the requisite documents. The very articulate Khalili – inspired here by Michel Foucault and other intellectuals – never cedes to the temptation of privileging idea over action, content over form or concept over the human subject. Simply hearing and humanising the lives of those forced to flea their home countries allows the audience to finally meet migrants as equals on their own ground. It is effectively their voices and not any artistic ploy that forces spectators to consider their attitudes towards migrants and the sometimes difficult, ethical decisions contemporary societies must take with regards to the globally displaced. Perhaps this has never been as critical as it is now. ‘The Mapping Journey Project’ is on show at the Museum of Modern Art (MoMA), New York, until 10 October 2016. More about the exhibition here. Born in Casablanca, Morocco and currently living in Berlin, Moroccan-French artist Bouchra Khalili studied film at the Sorbonne and the visual arts at the École Nationale Supérieure d’Arts de Cergy. Her work – encompassing video, photography, printmaking and installation and often playing with the documentary genre – investigates issues of language, subjectivity, cartography and political marginalization. Khalili has had solo shows around the world; most recently ‘Foreign Office’ at the Palais de Tokyo, Paris (2015) and ‘Garden Conversation’ at the Barcelona Museum of Contemporary Art (MACBA, 2015). Khalili has also recently participated in several important group shows like ‘Europe: The Future of History’ at the Kunsthaus, Zurich in 2015 and ‘Here and Elsewhere’ at the New Museum, New York in 2014. She is also the recipient of the Abraaj Group Art Prize (2014) and the SAM Art Prize 2013-2015, awarded by SAM Art Projects, Paris. 13.07.2016 – Exhibition review by Valerie Behiery – Images courtesy of MoMA and the artist. Valerie Behiery writes about the aesthetics and cultural politics of art and visual culture from or relating to the Middle East and North Africa with a special focus on women, plural identity and cross-cultural translation. Having a Ph.D. in art history, she has taught at several universities, done consultancy work for galleries and museums, and presented papers at international conferences. Her writing has appeared in art catalogues, reference works, peer-reviewed journals and art magazines, including Nafas, Islamic Arts Magazine and M: The Magazine of the Montreal Museum of Fine Arts.